According to signs posted on-site, carving what’s called the “art” pumpkins (these are the fake ones you can get at craft stores; I’m assuming some of these are probably used in certain sculptures for safety and structural reasons) starts in early summer. Each week for the run of the event, massive numbers of volunteers scoop pulp and seeds out of approximately 1000 pumpkins so they can be carved and replace the ones that rot. It takes 30 volunteers three hours before the first 5 p.m. entrance time to light all the votive candles (I might volunteer for this because that sounds like an awesome job!). Get more fun Blaze tidbits here. Someone arranged these pumpkins in the tree specifically so that it would look like bats were taking to the skies! It reminded me of the bats under the Congress Avenue Bridge in Austin, TX. This is timed entry, which means visitors purchase tickets in advance for a “tour time,” and it takes about forty-five minutes to wander through Blaze in all its spooky grandeur. The event runs from the first weekend in October until mid-November, and this year, adult tickets for weeknights were $20 and Saturdays were $25 (children 3-17 were less). There is a gift shop (of course!) and a concession stand with quite a large autumnal menu; this year’s selections included chili, pumpkin bread, and apple cider donuts. 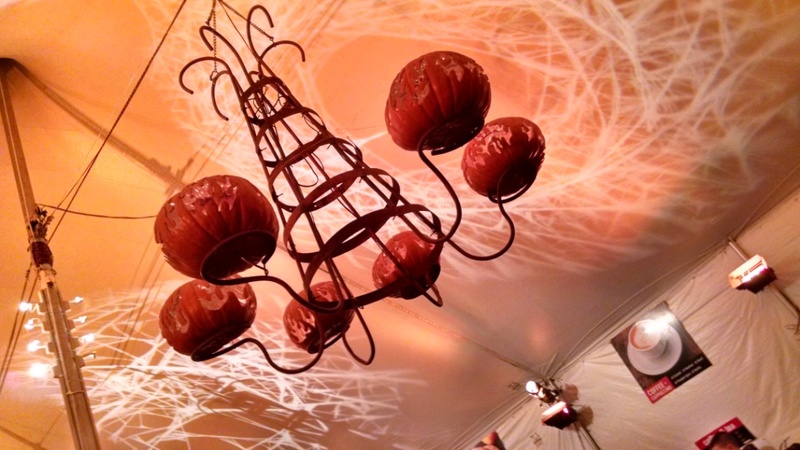 One of several chandeliers in the entrance tent. This awe-inspiring display must be seen in person to be believed, and it is well worth the ticket price whether you are with someone special, your family, or a group of friends. There are new displays added every year, and there is lots to do within five or six miles of the event whether you’re looking for something Halloween-themed or not; in addition, area hotels/bed and breakfasts offer Blaze packages (this latter thing is what I’m hoping to do next year with Nathan; it’d be great to have an early October weekend away). For everything you ever wanted to know about Blaze, including a history, frequently asked questions, and how to buy tickets and Richard Christy’s awesome soundtrack, visit here. For all of the Historic Hudson Valley’s offerings year round (they’ve got fun Christmas stuff coming up, too! ), visit here. If you’d just like to check out Christy’s Blaze soundtrack, it’s available at many outlets including Amazon. All the links for both scores, as well as free samples, can be found here. Mark your calendars for late summer when tickets will go on sale for the 2016 event! In the meantime, here are some photos and videos to whet your appetite. The event entrance tent — where we waited in line to enter the exhibit as well as purchase seasonal tummy-pleasing faves like apple cider donuts and chili — was atmospheric and made me feel as though I’d truly entered Ichabod Crane’s Sleepy Hollow. Our tickets — there’s a story behind them. We had originally purchased tickets for Saturday night, November 7, and Nathan got a flat tire on the way, so we missed out. We were both disappointed (Nathan way more than me), and I didn’t want to wait another whole year. Although the last few shows were sold out, the one on Thursday night had about 29 tickets left for the 8:30 showing. Where was my $40? WIN! A light rain was falling. Word to the wise: if you’re planning on going, be aware that the pathways through the exhibit are sometimes muddy. The great archway welcoming guests. Beyond that gate was the Land of 7,000 Pumpkins! The great arch’s cornerstone pumpkins. 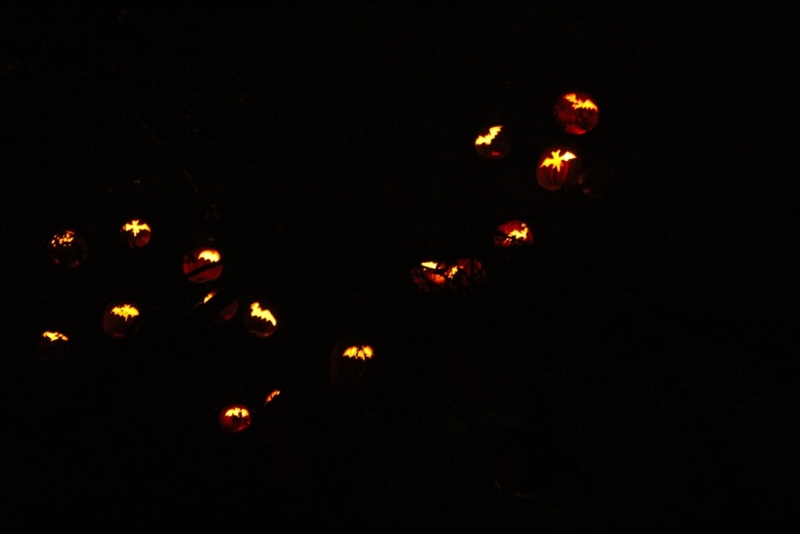 A few hundred jack o’ lanterns lined the walkway beyond the gate. I’d never thought about using the stalk as a nose before. Entering the bug garden. Pumpkins in trees were carved with butterflies, spiders, beetles, and other species in the insect world. Birds of prey (or possibly ravens) took flight at the entrance to the cemetery. Another shot of the bug garden. Oh no! The dead are rising from the grave! A unique detail: real candles in the many lanterns lining the property. A flower in the cemetery. The gravestones were actually large, long pumpkins. Here’s a shot of the long pumpkins used to make the graves. I’m not sure if they were real or if they were one of the “art” pumpkins. Stately Van Cortlandt Manor was tricked out for a spectacular treat! Me and Nathan. It wasn’t a very cold night, but it was damp. I had five layers of clothes on under my big orange coat (which was specifically purchased two sizes larger just for that purpose). A shot of the Van Cortlandt Manor’s “angry” presentation. See the video below! It’s the battle of the beasts…TRICERATOPS vs T-REX. This reminded me of THE BEAST FROM 20,000 FATHOMS, although I know there was no Triceratops in that. This Pterodactyl was perched over the scene. We left Jurassic Park and made our way to the next display: The web of the Black Widow spider. These skeletal spider creations ringed her web. A far shot of the Black Widow’s web and her progeny. The top of THE END IS NEAR clock. We met the characters of Sleepy Hollow before walking across the bridge. The famous Sleepy Hollow Bridge — recreated in pumpkin. A gorilla, tiger, and circus bear. An elephant lumbers alongside the circus caravan. The front of the circus train. A jack o’ lantern laughs in the dark. The Universal monsters also made an appearance. Here, The Mummy. A garden of man-eating plants. How very DAY OF THE TRIFFIDS! Even the sponsors got pumpkins. One of Blaze’s volunteers hard at work carving a pumpkin. There were still three nights to go, so there was still a need for replacements. A Headless Horseman statue in the gift shop. Apparently even Blaze was not immune to this year’s Star Wars craze. Frosted sugar cookies were always my favorite! Had we come before Halloween, I would’ve definitely bought this. Got to save a purchase for next year! No, I could not resist THE BLAZE journal. My journal and pencils; the pencils change color with the heat of the hand. They’re brown and orange. A shot glass (I actually, until this, never owned my own) and a button. This is the second volume of BLAZE the soundtrack. The first can still be purchased–but only digitally–on Amazon. Nathan got a shot glass, a pin, and a Christmas ornament. 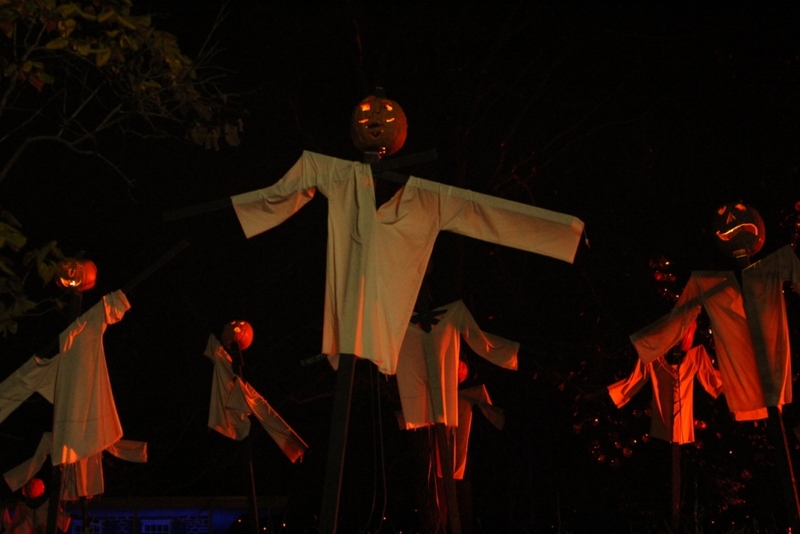 Posted on November 24, 2015, in Deep Thoughts & Fun Stuff and tagged Halloween events in lower New York State, Historic Hudson Valley, interesting things to do with pumpkins, pumpkin carving, The Great Jack O'Lantern Blaze, Van Cortlandt Manor. Bookmark the permalink. Leave a comment.